​Atletico Madrid's rise to stand among the superpowers of European football has been a remarkable achievement, but Diego Simeone must shake off the defensive shackles in order for his side to reach the next level. Traditionally unable to compete with esteemed domestic rivals Barcelona and Real Madrid, technically or financially, Simeone's battle to elevate his side alongside the top sides both of Spanish football and the continent was always going to be a war of attrition. Work ethic, gritty determination and an abundance of resourcefulness have been key to ​Atletico's recent rise to the forefront of Europe's top sides. Prior to Simeone's arrival as manager in 2011, Los Rojiblancos had not won a La Liga title since 1995/96. Atletico had managed to win the Europa League in 2009/10, but cracking the top tier of Europe's elite had proved to be much more difficult, as the shadows cast by ​Barcelona and ​Real Madrid loomed large over Madrid's 'second' club. However, in recent years Simeone has ingrained his personality and determination to succeed on his side, and provided a renewed and improved identity for the club that he represented in two different spells during his playing career. Atletico's grit and resilience in recent years have largely been a reflection of their manager, with their defensive work widely regarded as among the best in Europe, and has established them as one of the hardest sides to beat on the continent. Those qualities have seen Los Rojiblancos remarkably go on to win a first La Liga title in 18 years in the 2013/14 season, and that success was preceded by a Europa League triumph during Simeone's first season in charge in 2011/12. Arguably the greatest sign of Atletico's progress under the Argentine was reaching two Champions League finals in the space of three seasons between 2013/14 and 2015/16. Though Los Rojiblancos lost to Real Madrid on both occasions, their progress was abundantly clear. However, since emerging as one of Europe's top sides in recent times, that progress has largely stalled, as Atletico have failed to take the next step to the very top. Los Rojiblancos finished above Real Madrid in La Liga last season, but that was the first time that they managed to finish higher than third in the table since they won the title five seasons ago. In Europe, Simeone's side have also stalled, if not taken a step backwards. Last season's Europa League triumph was another trophy to add to the recent collection, but did not live up to the achievement of reaching Champions League finals in previous years. This season, Atletico's infamous grit and resolve looked to put them on course to eliminating one of the competition's favourites in ​Juventus in the round of 16. However, a lack of bravery and initiative saw the Spaniards surrender a 2-0 lead from the first leg and suffer a 3-2 aggregate defeat in the Champions League. That tie largely represented the difference between Atletico's potential and their actual ability to reach the next level with their current methods. Instead of imposing their advantage from the first leg and seeing the result through, Atletico fell victim to their own reserved approach and unwillingness to take control. Simeone went defensive in Turin and ​Cristiano Ronaldo punished him for it - and his celebrations said it all. Atletico are no longer the side on the periphery of Spanish football's best, operating on a minimal budget and looking to punch above their weight. 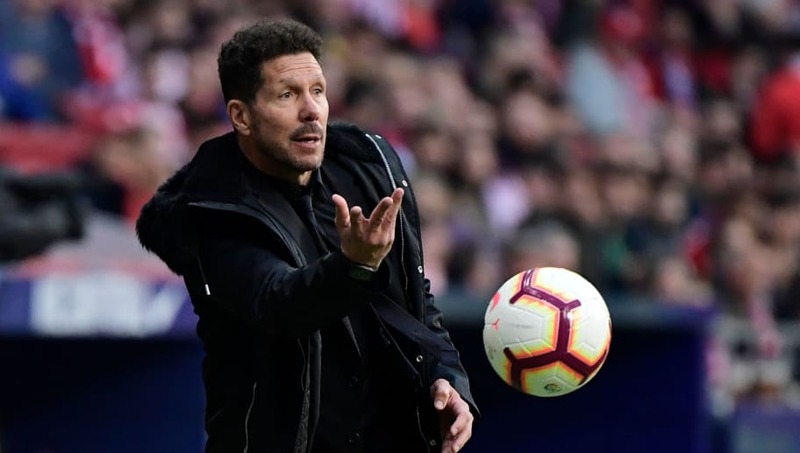 Recent successes have elevated them above that level, but Simeone's emphasis on defence and the dark arts is now holding them back from taking the next step to become a truly dominant force in Spain and Europe. Los Rojiblancos no longer have an average squad which depends so wholly on streetwise tactics. They boast an all-star lineup which consists of some of the best attacking talents on the continent, yet Simeone's team selections continue to ensure a self-imposed negativity. Antoine Griezmann often appears at his best when surrounded by attacking support, such as ​Kylian Mbappe in the French national team. However, alongside one, less mobile strike partner ahead of a flat midfield four, Griezmann is so often left isolated up front for Atletico. Nicolas Guitan, Gelson Martins, Jackson Martinez, Yannick Ferreira Carrasco and, most recently, Thomas Lemar are among the attacking stars signed by Simeone in recent years, only to be discarded shortly after due to his favouring of defence-minded players. More often than not this season, particularly in big games, Saul Niguez and Koke have been deployed on the flanks of a flat midfield four - despite both being better suited in the middle of the park. These tactics enforce a fundamentally negative approach, detaching the midfield from the attack and often leaving Atletico devoid of fluidity and freedom going forward. The approach has been the blueprint in enabling Atletico to dig in and punch above their weight, often enabling them to reach heights which hardly seemed possible in previous years under Simeone, but Los Rojiblancos are now of a higher stature and should aim to perform as such. The move from the Vicente Calderon to the state-of-the-art Wanda Metropolitano last season appeared to be the final step towards Atletico cementing their status as a European superpower, but their team mentality remains a backwards hindrance. Simeone must give his side the freedom to express the true quality that is bustling throughout their ranks to truly reflect their achievements and progress in the last decade, and to allow them to take the next step to the very highest level.